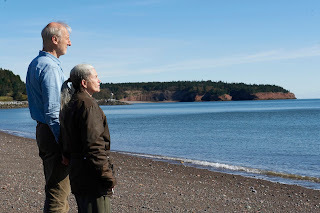 James Cromwell as Craig and Genevieve Bujold as Irene in STILL MINE. Still Mine is a lovely little film written and directed by Michael McGowan. It stars James Cromwell and Genèvieve Bujold. The film tells the true story of Craig Morrison, an elderly man who decides to build a new house for him and his wife after she gets dementia. However, a town official is less than pleased with this plan and tries to stop Craig from building the house. James Cromwell's performance is what makes this movie as poignant and beautiful as it is. Time and time again Cromwell has proven himself to be a master of subtlety in supporting roles in such films as Babe, The Artist, and L.A. Confidential. Never has he led a film, though. His performance as Craig is astounding. Cromwell portrays Craig as a kind, stubborn, determined, and very loving man who would do anything for his wife. In some scenes, no words are spoken and everything is conveyed through Cromwell's expressive face. When Craig's wife is in the hospital in part of the movie, it is the first time they've not been together in many years. We see Craig lying in bed as he reaches over to grab hold of his wife's pillow. He misses her. Cromwell turns this into the most powerful scene of the film without words. It hurts to look into his eyes because of the pain and sadness brewing behind them. This performance will easily go down as one of his best, if not his best. While Still Mine does boast a fantastic lead performance, it is still also a very good piece of filmmaking. Yes, there are some parts that are a tad too sentimental, but the film is never exploitative or insincere. Craig's story is inspirational, yet writer/director McGowan never tries to milk the story for emotion. He wisely leaves that up to his actors. This is a quiet movie that slowly creeps up on you and has some scenes that will move you to tears. McGowan made another smart decision by focusing the movie on Craig, not the dementia. Still Mine does not turn into another disease-of-the-week Lifetime movie. This movie is about Craig, and the dementia serves a subplot. This could have been a heartbreaker had the dementia come to the forefront, but by keeping it back, McGowan allows everything else to develop. Overall, Still Mine is a really great movie. It is easy to watch and quite enjoyable, but it is James Cromwell's performance that makes it completely worth it. I was very impressed by this movie and it showed me that there are still people out there who are smart enough to make a movie like this subtle and affecting.